Twenty-four public elementary schools and 4 public high schools in the Division of La Carlota favorably complied with the survey conducted by the Pantawid Pamilyang Pilipino Program (4Ps) team in a half-day orientation at the social hall of La Carlota. Western Visayas DSWD officer, Belen P. Gebusion, in-charged in Provincial Link Negros Cluster 4Ps lauded the respective school principals for their alert and active participation on said survey. 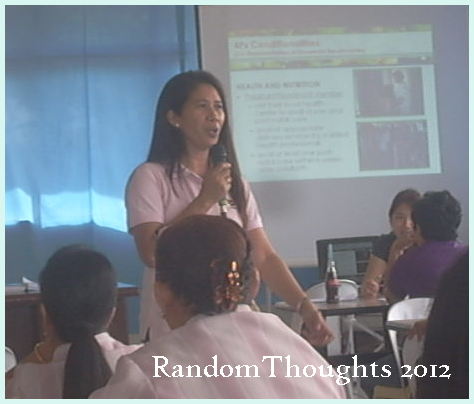 She expounded the rudiments of 4Ps social assistance and development through a PowerPoint presentation. The Pantawid Pamilyang Pilipino Program is one of the responses of the Philippine government to the challenge of achieving the millennium development goals (MDG). She also enlightened the school heads and principals who are in attendance the importance of the survey for the implementation of this program as far as the enrollment of the pupils is concerned. She believed that the Department of Education (DepEd) would have the significant contribution for the success of this program. The implementation of this program is good when the school principals is supporting this. Earlier, Regina Dativo, SW0 3, Negros South cluster solicited reactions, remarks, experiences from the participants on the granting of school certification to the children-beneficiary, their regular attendance in the school as a basic information needed. Objectives of supply side assessment are to assess the present condition, define the gaps and needs and secure the commitment. One thousand seven hundred beneficiaries/grantees are in La Carlota. The school heads are looking forward for the success of this program for they're optimistic that the school drop-outs will be eliminated, 100% school completion and retention rate be attained within a year and the succeeding years. i could say, this is one of the best programs offered in the country for education..really has helped a lot of Filipinos. True. Magiging succesful lang ang program na to with the cooperation of everybody, especially the school principals. Though sana, hindi lang to sa ngayon. Halos lahat kasi ng government programs, maganda sa umpisa pero napapabayaan.. Kelangan talagang bigyang pansin ang edukasyon sa Pilipinas. I agree with Miss Leah, sana talaga hindi lang to ngayon lang. Sana magtuloy-tuloy sya at hindi mabago ang quality ng service na binibigay. Sa panahong sinasabing "Education is not a right anymore but a privilege", malaking tulong ito. another great project sir! Hopefully our government will prioritize this project, our kids really need this for their future. They should all be given a chance to better their future with proper education. Your entries are always so insipiring. Thank you for sharing. You are very exposed to so may projects, Sir Gil. Hoping for the success of this one. This program is already taking effect in Mindanao. I remember when I went home last October, there was some point that ATM machines are really jam packed because of the recipients of this program. thanks for sharing more on the 4Ps cycle! looks like this is a good project and i hope that it will be successful. i'm glad you are able to spread the word on this program. i hope this program will pull through for more. btw, dep ed doesn't have a hand on this? hope the program to prosper and would materialize... and the funds would go exactly to where they are allotted. more power to the implementers. Yahweh bless. The program is really inspiring and a big help to the people in your city.I pray for it to succeed . This government program is really helpful. I hope the gov't continuously support this for the sake of the unfortunate children. Another great government program. Nice. This is really inspiring.